Music is a brilliant tool for connecting and reconnecting with children. When working with children in a group setting, finding opportunities to really connect and build relationships with each child can be tricky as we are often working to maintain the focus of the whole group or gently guiding group dynamics and practicing ‘crowd control’. When working with under 5s, we are working with children who are just at the beginning of negotiating social interactions and they need a lot of guidance and support. Young babies and toddlers haven’t yet reached the developmental stage of ‘playing together’ and will play alongside each other and struggle with the influence other children can have on their play. Pre-schoolers are making rapid developments in understanding their own autonomy and expressing themselves and also need plenty of hands on guidance in interacting and cooperating. All under 5s need a lot of support with using communal toys and materials and the conflicts that come up with sharing. Sometimes we can feel run off our feet just putting out fires and managing behaviour. If we hope to do more than, if we seek to find room to support these children as they learn from these social experiences and develop emotionally, we need a relationship and mutual connection with each child to work from. Our role as a group facilitators is a busy one and at times it can seem difficult to take the time to connect to children individually and observe and support their emotional needs. Music is often used as part of group activities with children but when we keep in mind how valuable this music time can be for connecting and building relationships, we can really be mindful of making the most of it. 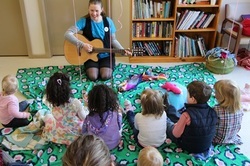 Music is a fun and connecting experience for children and their caregivers. Being silly and lowering our inhibitions or shyness while singing and moving to music brings down barriers between people. Finding a place of relaxed connection sets us up to have a point of reference later, it opens a connection between a child and a caregiver and creates a platform from which we can later reference that emotional connection. To be able to help a child remember a place of emotional connection and find refuge in it gives us a huge head start and a place to build from when trying to support a child that is feeling alienated and upset. Without a place of connection to start with, reaching that child can be very difficult and we end up with children unsupported and falling through the cracks. Interacting with children through music is a place where we can observe their interaction style, whether they like to hang back a bit or if they're right up front, and meet them where they are at. We can notice if a child is not engaging and change the dynamic of the music session to be more inclusive. By noticing children's individual ways of connecting, the different intensity levels each child needs and making room for that child to feel included and have these needs validated we are setting up and environment where a child is more likely to feel safe from feeling overwhelmed or threatened. Engaging though music offers us another opportunity to show children that we can see their individual needs and that we care about them. Making eye contact, drawing each child in to the experience, in the way that makes them feel understood and not just jollied along is another way letting a child know that they can trust us with their vulnerability and their feelings. Later, when issues come up for a child and we need to step in to help resolve a conflict, we have a better chance of emotionally supporting a child and finding a happy resolution if we have already demonstrated that we care about their feelings. In having those experiences of connection through music, later when conflict arises, the relationship is there to catch the struggling child the child. 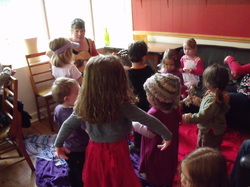 Taking the opportunity to remember that music time is a time for connecting we can turn it from a process of leading a group to one of connecting with each child, in a group setting. Spending a few minutes interacting to music, being silly, making eye contact, just being together really helps build connections. Taking the sharp edges off caregiver/child interactions and creating opportunity for reconnection are the small but incredibly important differences that can nourish relationships and help us raise confident, secure, happy children. 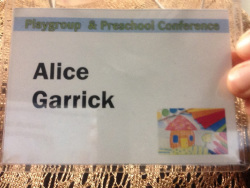 I recently spoke at the Stories of Childhood Conference in Melbourne on the topic of supporting children's emotional development through music. I'm going to do a few posts covering some of the material I spoke about at the Conference. We'll start with a brief look at some aspects of children's emotional development, relying on the work of some of my favourite psychologists and their take on the subject. In other posts I'll lead into how and why we can use music to support kids emotional development. Self-esteem is a concept that is discussed a lot when we talk about what we are hoping to foster and support in children. Often what we mean when we talk about self-esteem is a self belief and a confidence based on an internal sense of self and a sense of value that is not based on external factors. The ways to support an internal security and sense of self can be as simple as being connected to a child, being present for them and allowing an attachment to form. Children are all different and having a toolbox of ideas for how to connect to children in different ways and how to recognise that different approaches may be needed with each child can be invaluable resources for working those working with children. However, it can often be easy to mistake the tool, the strategy or approach, for the actual magic, which is the connection and relationship between the child and the caregiver. It can be hard sometimes to remember what it felt like to be a kid but caregivers who are able to make that shift in perspective and understand the qualitatively different thinking of a child, as well as the frustrations of feeling small and powerless in a big peoples world, can have empathy and understanding of their children's actions and motivations. That can be such a startling shift in understanding the needs of the child and empathy for their experience that a tense situation where caregiver and child are at loggerheads can quickly turn into a mutually respectful and validating interaction that brings child and caregiver closer. Dr John Gottman, author of ‘The Heart of Parenting: Raising an Emotionally Intelligent Child’ suggests that the development of Emotional Intelligence is supported by caregivers through words of understanding, empathy, and validation, which must precede words of advice. He proposes that emotions can only be controlled and regulated when they are understood by the child and that for advice to be understood and heeded, children need to be supported in understanding the emotions they are feeling preceding caregiver advice. Through his research, Dr Gottman has discovered and described two ways adults approach and deal with children’s feelings. He describes these two responses to emotion as ‘Emotion Dismissing’ and ‘Emotion Coaching’. Don’t notice lower intensity emotions in self and kids (and others too). See negative affect as toxins and want to protect child from having these negative emotions. Prefer a cheerful child. Think that the longer the child stays in the negative emotional state, the more toxic it is. Are impatient with kids’ negativity. May punish a child just for being angry even if there is no misbehaviour. See introspecting as a waste of time, or even dangerous. No detailed lexicon (vocabulary) for emotions. Want reason to control emotion. They are uncomfortable with strong emotions. In describing the benefits and reasons for caregivers to cultivate the Emotion Coaching response over the Emotion Dismissing response, Dr Gottman argues that there are many books written for parents and caregivers that advise adults on how to use discipline techniques with children which deal with children’s difficult behaviour or emotional outbursts and result in obedient, cooperative children. Dr Gottman says that, while there is nothing wrong with wanting and to some degree expecting cooperative children, most of us want much more for our children than obedience. Think for themselves. Even disagree with us. Be moral people. To have value system similar to those we have. To have good relationships with others. To select a mate who won’t mistreat them, have a good family of their own someday. To have good social judgment. To enjoy their talents, explore their abilities. To be gentle, but strong. To be proud of themselves, but not boastful. To have purpose and meaning in their lives. To have interests, self esteem. To live for something beyond themselves, not be materialistic, care about the welfare of the world. Dr Gordon Neufeld, Developmental Psychologist and co-author of, ‘Hold On To Your Kids: Why Parents Need to Matter More Than Peers’ (co-authored with Canadian physician Gabor Maté)’ bases his developmental Theory of Attachment on the importance of connection and attachment between children and caregivers. To be able to support a child’s emotional development children need to feel a secure attachment to caregivers. Children need to feel connected and safe, so that that the caregiver is a compass point, a person the child admires, desires to emulate and wants to please. Neufeld says that only through attachment can we hope to guide, advise and emotionally support children for without it we don’t have access to the heart of that child. Dr Neufeld proposes ideas and strategies to help caregivers guide and support children but advises that no method, technique or strategy for managing children’s behaviour will work in the best interests of the child's development or have positive long term outcomes for the child if that caregiver does not first have that child’s heart, have that child’s attachment. Dr Neufeld’s work offers an enormous resource for caregivers in how to cultivate the attachment of a child, through love, patience and respect. 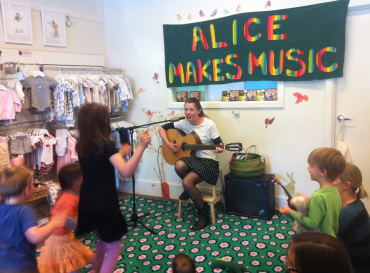 10% of all proceeds from sales of any Alice Makes Music CDs between now and Christmas will be going to support the Red Cross Typhoon Haiyan Appeal. You can also support the appeal directly here. Some of my Alice Makes Music T-shirts are finding their way across the world to children in need this Christmas (because who doesn't need an Alice Makes Music t-shirt ;)). 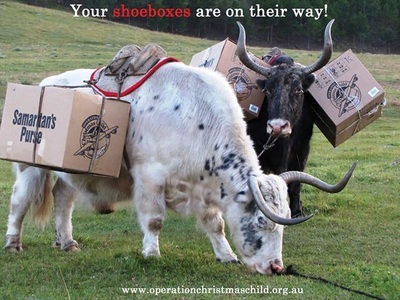 My kids and some of their friends got together and packed some boxes for Operation Christmas Child this year. Teddy bear, doll, soft toy, etc. 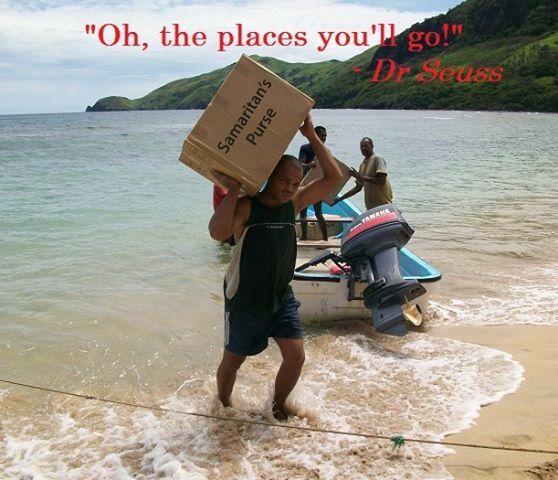 T-shirt, shorts, underwear, cap, beanie, sandals, thongs, etc. 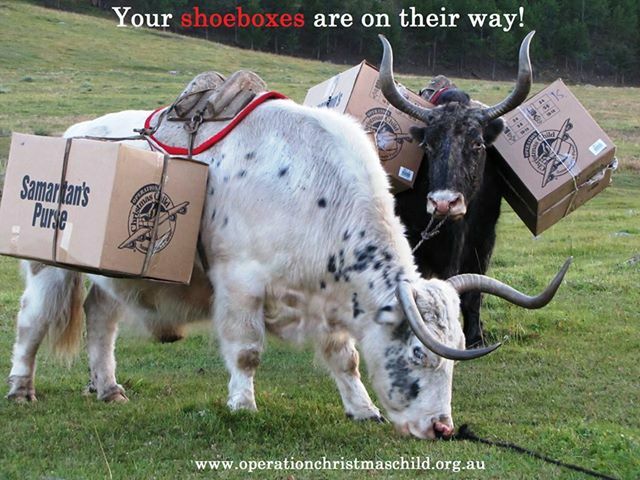 You can check out the wonderful work that Samaritan's Purse and Operation Christmas Child do over here. Their front page has a video of some *very excited* children receiving their boxes. FREE POSTAGE UNTIL DECEMBER 20! So much Alice Makes Music in one bundle. Great Christmas present for the dinosaur lover in your life. 1 copy of 'Songs of Connection' CD, 1 copy of 'Play is Serious Business' CD and 5 Frank the Dinosaur (in a santa hat) stickers! Includes immediate download of the digital version of 'Play is Serious Business'. If you're having a browse through the magazines while waiting at the supermarket check out this month, you might see me! 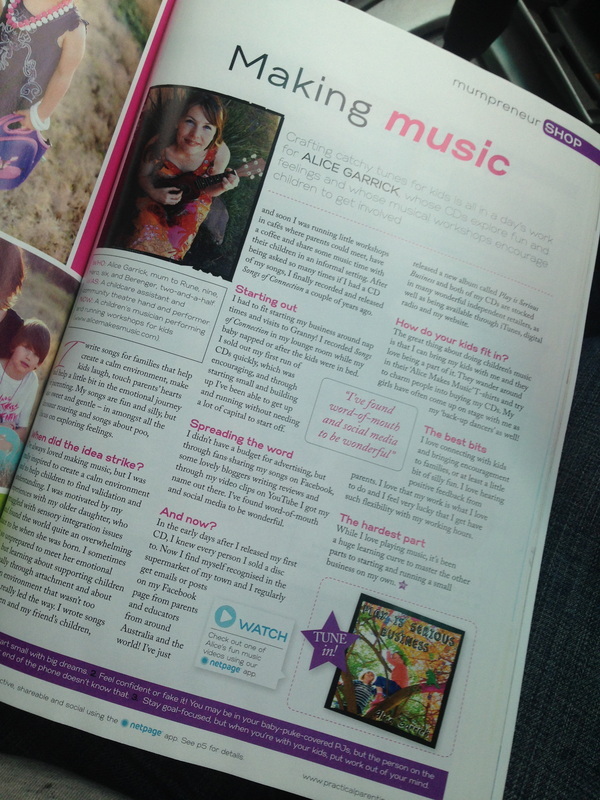 Alice Makes Music is being featured in the November issue of Practical Parenting magazine, apparently I'm a Mumpreneur! My scanner is being uncooperative so I'll put a nicely scanned version up later but here is the excited iphone snap (while still sitting in my car in the car park of the supermarket, eager). I wasn't very cool or nonchalant while buying my copy of the mag, I think the lady at the check out was a little overwhelmed with my bouncing around. She did jump on the wave excitement with me though (very generous of her) and we had a few 'Hoorays' together. relationship, even on those busy days when stress invades us and tempers heat. How did you come to writing songs for children? the rapport and connection is there, learning flows much more easily. some pretty wonderful and supportive friends. How do you tailor songs for children musically? are interactive and engaging so I like to play with tempo and silly concepts. What do you aim to give children through your songs? music is to support and encourage emotional connection and relationships. to support kids and their grown-ups in connecting with each other. with the kids to make it work for them. I had the pleasure of being interviewed by Tara Hashambhoy from Nurture Parenting Magazine recently. You can read the interview below or over on their website. Super dooper 24 hour super sale! 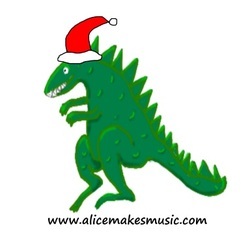 24 hours only, 50% of all downloads and CDs in the Alice Makes Music.com shop! Also, super dooper special, for you lovely Alice Makes Music Facebook and twitter fans, share on your facebook page or tweet about my super sale (and tag me) and I'll message you a code for a free download of your choice! Thats pretty exciting, no?! 24 hours starting.... now! I've been very quiet around here recently! I've been taking a looong break and doing lots of mum stuff with my kids. My oldest turned 9 years old (!) this weekend and is well and truly leaving the baby years behind her *sniff*. I'm very proud of the brave and thoughtful young lady she is growing into though and she'll always be my baby even though she's starting to catch up to me in height. I did get a dose of cute babies this weekend though by playing some songs at a gorgeous 1st Birthday Party. Such little cuties with their great big roars!